Little Daddy?s newness assortment for spring begins with this bold addition. 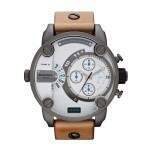 Genuine tan leather meets gunmetal plating for an incendiary combination rivaled by no one. Sleek white and blue dial details add the perfect touch of edge to this instant classic.